Saturday morning I made my way over to Coventry's Canal Basin to check out the new shop called 'Youpunkeroo' that I talked about in my last post. I was met at the door by the owner, a lady called Lisa who recognised me from my avatar picture. It turns out that Youpunkeroo is a craft workshop and drop in centre, rather than a shop exactly. The idea is that you turn up and try out crafts, with Lisa and her husband on hand to teach you the basics. Website is here and blog here. Thursday nights is craft night, intended for knitting and other needlecrafts but Lisa said they had the pottery wheel going last week as two ladies wanted to have a go. The group meets from 7pm to 9pm and it's currently free, but a nominal charge (or kitty) may be introduced to cover tea, cakes and heating, depending on how things go... Which sounds fair enough to me. Good luck, Lisa - hope things go well for you! As it was, I arrived first so got my pick of spot on the comfy sofa. I had tea and did some spinning. There were crisps/chips and excellent dip and Lorna's famed 'wet chicken' soup which sadly never got sampled. Then there was more tea, cupcakes and knitting as I started on the second (third) Jaywalker to match this one which I finished last week. Good company and a pleasant afternoon, doing needlework - what more could I ask for. It also turned out I knew more about how to fix knitting which has gone wrong than I thought I did, even if the knitting in question was defying the laws of physics and knitting! 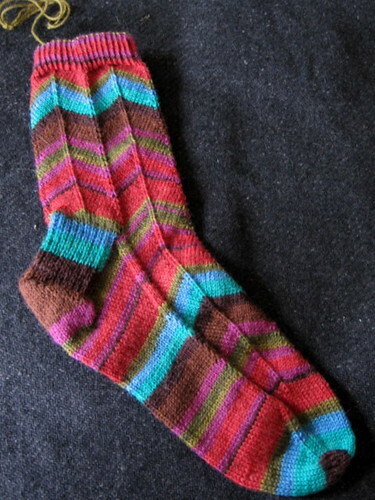 Sock looks great! oping to check out Youpunkeroo on Thursday. I was thwarted last week by Ruari "forgetting" he had a meeting at Coombe Abbey that evening, even though I'd asked him earlier in the week if his diary was clear so he could babysit! Men! I was planning to check out the Youpunkeroo on Friday but Ed stared throwing up..then i was going to take Dom tomorrow (it's half term) but that relys on Ed going to nursery which isn't going to happen as he still isn't well :( So keep your fingers crossed he gets well soon and Dom and I can pop over there Friday.. even if Ed is well I don't think taking him as well is ideal! Glad the sock turned out well and Sunday was fun. we got the shed up so while I would have loved to come the time was well used. Sounds interesting :-) Sock looks great too, you lot had better save me a virtual cupcake next time!